Looking up O'Connell Street from the Fort Street carpark at the beautiful 'Chicago School' style General Building on the left, and the Metropolis building towering above and behind it. 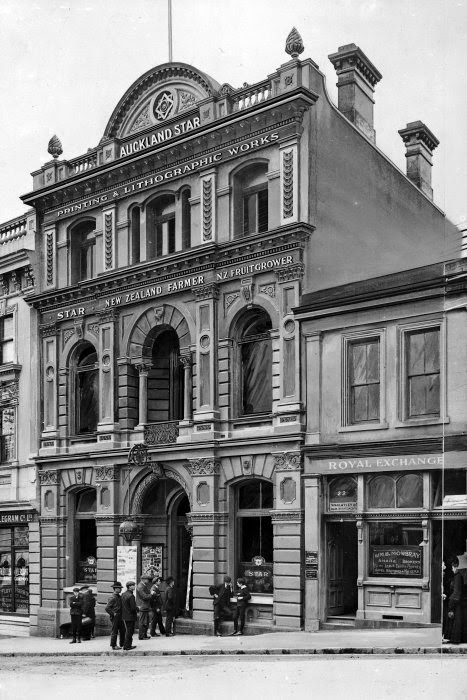 Auckland Star building demolished in 1989. That's it below viewed from Shortland Street in 1910.
be developed into a – surprise – 4 story Carpark! The Transport blog has a good thread on the subject here. Negatives. Ref: 1/1-002917-G. Alexander Turnbull Library, Wellington, New Zealand.